On Thursday, November 5th, 2009, the Heritage Foundation of Newfoundland and Labrador’s Intangible Cultural Heritage program, as part of the annual St. John’s Storytelling Festival, is organizing a half-day symposium on how new technologies are being incorporated into storytelling. 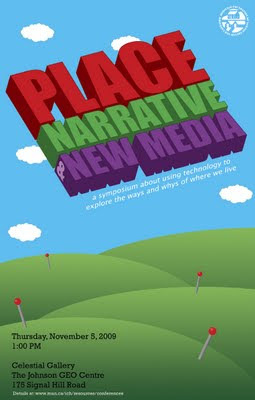 Several invited speakers will detail how they are using new media or technology to tell the stories of real places. Chris Brookes will speak about the [Here]Say, a story map of Water street that allows people to listen to stories, via cell phone, about the location they are standing in at that moment. Marlene Brooks brings us news on 3D Virtual World Storytelling, and will explain how Conne River and Cupids 400 Projects are using Second Life to preserve cultural stories of local communities. New York is only a click away: Jedediah Baker will explain how through his discussion of City Lore's City of Memories. Parks Canada is Implementing GPS based interpretation at a number of their sites and Cupids 400 will be launching an iTouch based interpretation of the 1610 archaeological site. After brief presentations by all invited speakers, an open panel discussion of the potential of such technology, as well as some of the possible problems, will ensue. What are we able to accomplish and what would we like to be able to accomplish with these resources? How can technology help link place and story? Come see, share, and participate! Free admission to pre-registered participants.